Crosshatch. While most of these designs are engineered, it would be beautiful to go in a long hallway that longs for distinction and character. And there are so many pattern options, finishes and species to choose from. With the mirror image of triangles or squares, depending on what angle you look down, the geometric genius of this design can bring some personality to that area which is always neglected in your home. Running Bond. The look and feel of this design is ongoing and works very much like stripes do in clothing. If the stripes are vertical, it appears slimming. Imagine seeing a running bond hardwood design in a home. It will make any room appear bigger. Go with a grey tone and provide your room with a hint of class. Multi-Toned. This style is perfect for those going for the rustic look. 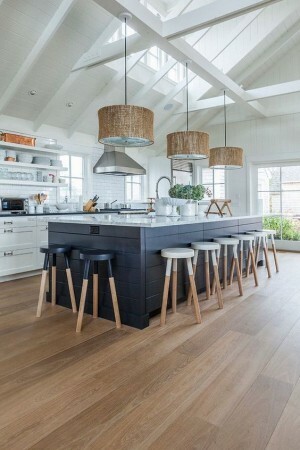 Not staying to the same color of wood, it provides character to any kitchen or living space. This pairs well with contemporary designed homes. Installing the wood in a unique zig-zag design will reintroduce a very retro look that was once extremely popular in apartments with natural hardwood flooring. Painted. Sometimes money doesn’t allow for hardwood flooring in your home. Or perhaps you want the look of hardwood in a room that isn’t hardwood floor friendly. One example of such a room is the bathroom. With daily bath times and visits to the washroom, there could be a lot of wet wear and tear to the floor; and hardwood is no friend to water. In this situation, painting a hardwood floor might not be a bad idea. There are so many online tutorials providing you with step by step instructions on how to get the look of a wood finish with just a few brush strokes. Done right, you can paint the best wood floors in your bathroom without putting down the hefty price for it. Striped. A very unique trend now is striped wood flooring. This look can be achieved by taking two totally different wood types (preferably dark wood with almost white wood) and installing them adjacent to each other. The end result is quite awesome and remarkably simple to do. Herringbone. This is a more complicated flooring, but with the smaller rectangular blocks forming an intricate pattern, the effort into the installation is completely worth it. The pattern itself looks similar to a fish skeleton, giving it the name herringbone. Having such a busy design on the floor can open up the opportunity for simple, natural design throughout the rest of the room.